Yesterday on the blog I discussed how to turn your tangible media – printed photos, old VHS and DVD home videos, CDs, and paperwork – into digital files, and I also shared how to store tangible copies. 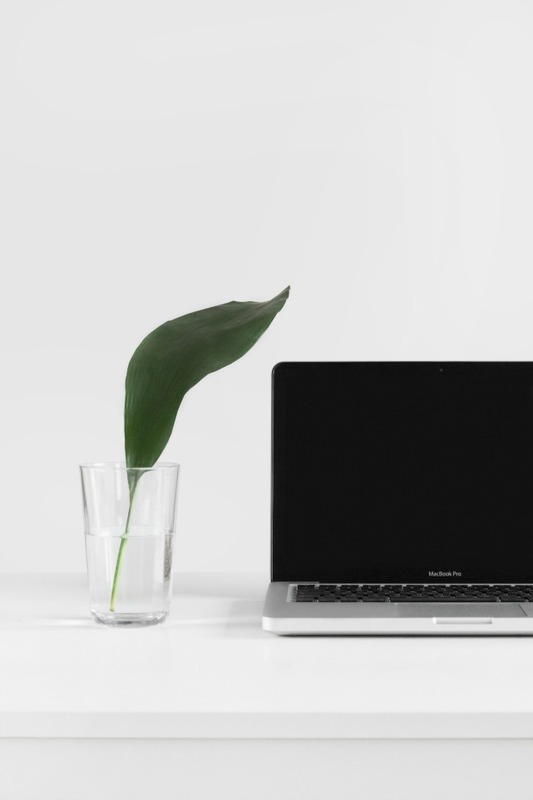 Today I’m going to share with you how to organize and back up all of those files that you digitized and I’m also going to share with you how to manage the upkeep of new files that are constantly created. 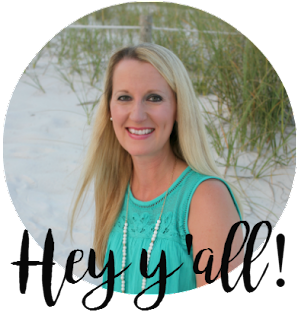 So, if you missed my post yesterday, you may want to go back and read it (here) before you get started on today’s post! Digital files are the files of today – the photos and videos that are taken with a digital camera or smart phone, digitally downloaded music, papers created on the computer or scanned into the computer. 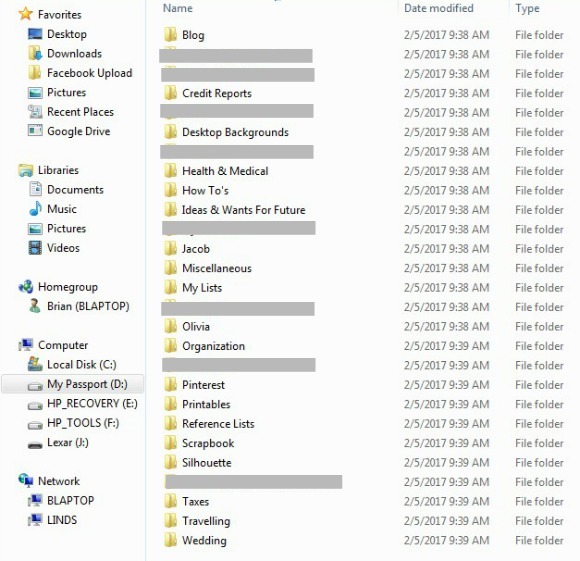 First I'm going to talk about how to organize your digital files, then how to back them up, and then I'm going to show you some examples of my folders. 1. Create a “Photos” folder. 2. Organize all digital photos in separate folders within your “Photos” folder by date. I use the following format to label my folders because it keeps them in chronological order – four-digit year, dash, two-digit month, space, month name. For example, “2018-01 January.” Labeling your folders this way keeps them in chronological order in your main folder. 3. All photos created in that month go in the folder for that month. For example, all photos created in January 2018 go in the “2018-01 January” folder. 1. Create a “Videos” folder. 3. 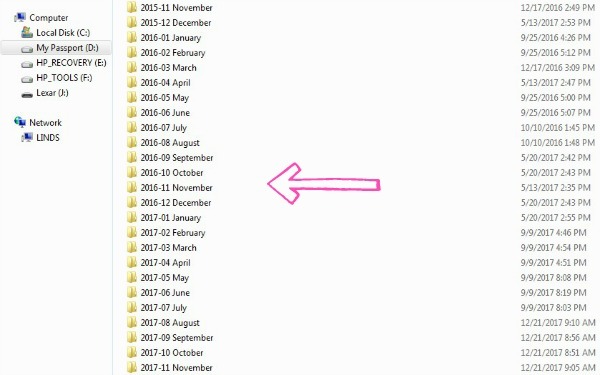 All videos created in that month go in the folder for that month. For example, all videos created in January 2018 to in the “2018-01 January” folder. 1. Create a “Music” folder. 3. Transfer all songs to your “Music” folder. They will then be listed in alphabetical order by artist and song title. When you have thousands of songs like I do, this is very helpful. 1. Create a “Papers” folder. 4. Move all documents to their appropriate folders. Once all of your files are digitized and organized into folders, it’s time to back them up. I am extremely paranoid about losing my files, especially my pictures, so I back them up in three places. 3. To Amazon Drive (this is a backup of my backup – LOL – that is kept online so if all else fails, my photos will still exist.) Pictures are very important to me, so I don’t mess around with their safety. If you don’t like Amazon Drive you could use Google Drive or any of the other online storage services. 4. Once everything is backed up all three times, delete original files from phone, camera, and computer. This means that you will only have a maximum of one month’s worth of photos on your phone, camera, and computer at all times. That’s a great thing because having all of them on your computer can slow it down exponentially! And if you need to access an old photo, you can easily pull the external hard drive out of your desk drawer any time you need it. Easy peasy! 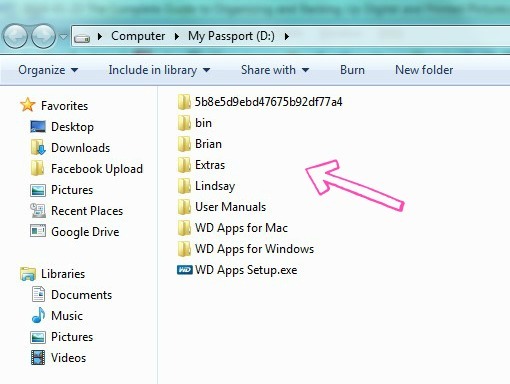 Immediately upon opening the hard drive there are two folders: “Brian” and “Lindsay.” (You can ignore all of the other folders because they were default folders that came with the external hard drive.) 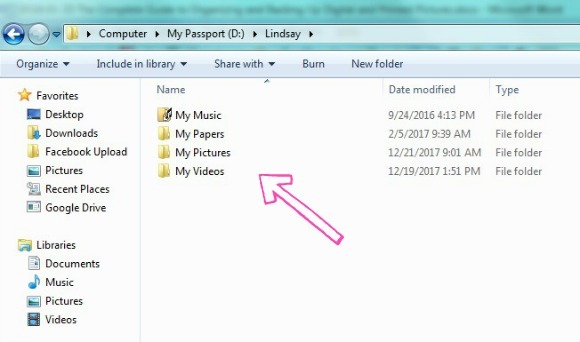 The “Brian” folder holds all of Brian’s photos, videos, music, and papers that he’s taken through the years and the “Lindsay” folder holds all of my photos, videos, music, and papers that I’ve taken through the years. Like, literally, every single file. Inside the “My Pictures” folder are all of the pictures I have ever taken (digital and film) and they are all arranged by year and month. Now we’ll take a look inside one of the monthly folders so you can see how each of those is arranged. 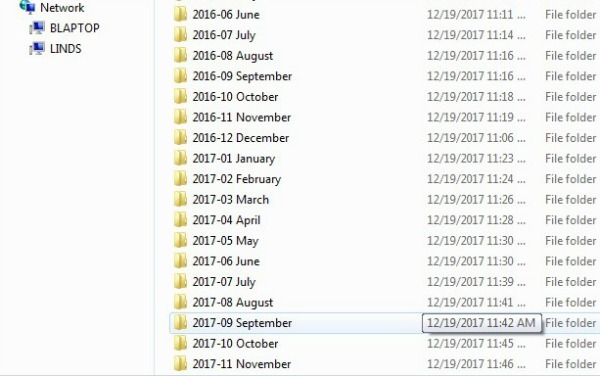 As you can see, the “2017-11 November” folder contains three folders. The first two folders are photos that were taken of big events with my fancy camera. As I mentioned before, I like to keep those separate, so that’s why they are in their own folders. They are labeled by date and event so I can easily find what I’m looking for. Then there is one generic folder for all of my iPhone pictures. The “My Videos” folder is arranged similarly in folders labeled by year and month so they are easy to access. 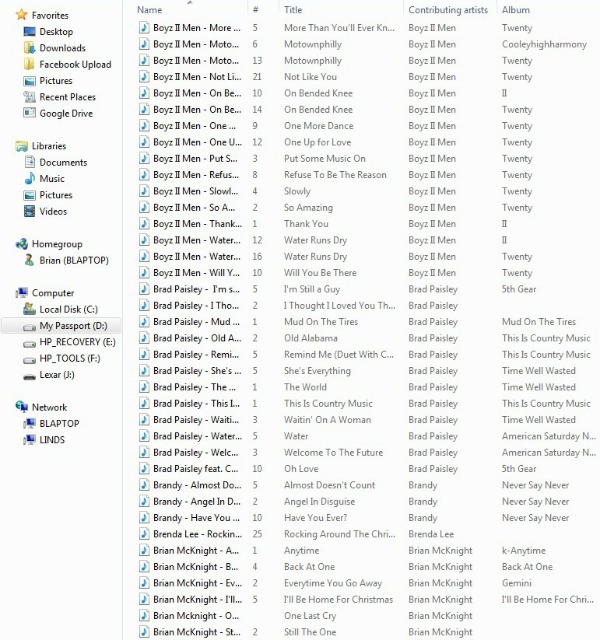 The “My Music” folder is in alphabetical order by artist and song title. Both external hard drives as well as our Amazon Drive are identical. See, organized to the max and easy to find everything, right? Now that you’ve digitized all of your old files, organized them, and backed them up, you’re sitting pretty, and all you have to do is manage the new ones that come in! This usually takes around 20 minutes per week and 30 extra minutes to back them up once a month is over for me, personally. 1. Transfer all photos and videos from phone and camera to computer. 2. Delete any duplicate photos or anything that you don’t want to keep. 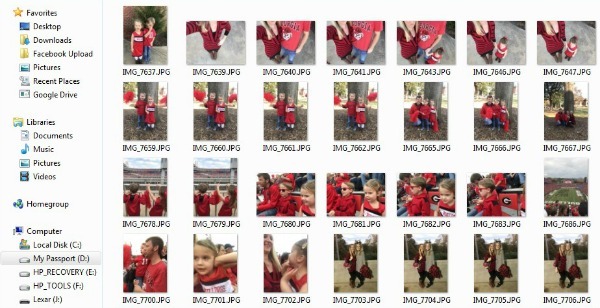 When you’re a parent, sometimes you have to take 20 pictures of the same shot to get one good one, so now is the time to delete the 19 bad ones! Haha. 3. Move videos to a separate folder for videos labeled by year and month. 4. Move photo files to the folder for that year and month, separating the phone photos from the photos taken with the fancy camera. 1. Copy and paste all files from the previous month to the external hard drive in your desk drawer. 2. Copy and paste all files from the previous month to the external hard drive in your safe. 3. Copy and paste all files from the previous month to Amazon Drive (or whatever online storage service you use). 4. Once everything is backed up all three times, delete original files from phone, camera, and computer. 5. Create new folder for the new month and start all over again! * Music and paperwork should be added to the appropriate folders and backed up as it comes in or you could back it up once a month or so if you prefer. Using the method that I have discussed the last two days has made my life a million times easier. It was a ton of work up front converting all of our old files to digital, but the weekly and monthly upkeep is a breeze. And it means that every photo I own (taken with film and digital cameras), every video I own (taken with VHS and DVD and digital), every song I own (from CDs and digital), and every paper I own are organized and backed up in the same place – one external hard drive in my desk drawer, one external hard drive in our fireproof safe, and on our Amazon drive. No more pictures scattered about, no more bulky photo albums, no more stacks and stacks of home videos or CDs. Using this method, you can literally hold all of your personal media in your hands! All you need is a photo storage case (see previous post for explanation), an external hard drive, a back-up external hard drive, and an Amazon Drive subscription. It also means that I can access any memory at any time from anywhere (with Amazon Drive) and I am also able to rest easy in knowing that I shouldn’t ever have to worry about losing any of our media. If our house was ever on fire, the only thing I would need to grab would be our external hard drive! And even if I couldn’t, everything is still backed up online. Whew. I know this was a ton of information but I hope you found it useful! Now get to organizing! 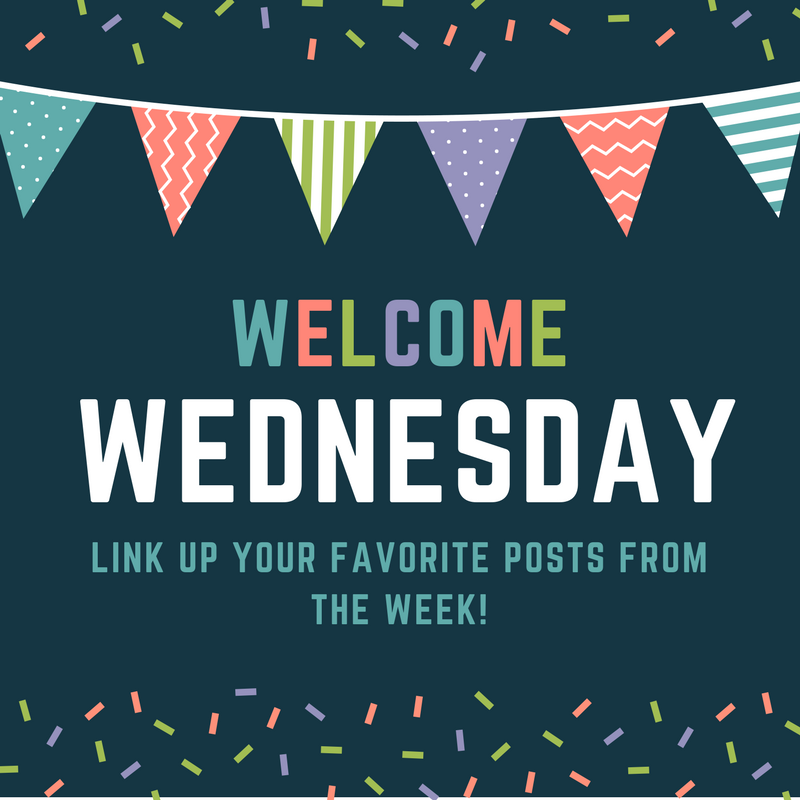 *Linking up with Jessi's Design and Going the Distance for What's Hap-"Pinning" Wednesday. Question...I may have missed it. When you upload them, you have to pick which folder they go into, correct? Right now, when I upload all my pictures (we have a Mac) they all go into my "photos" file.. I have over 18,000 pictures there!! EEK! We have two hard drives too. One is kept here, and another one we keep at someone else's house. Although getting one to keep in a safe isn't a bad idea either! 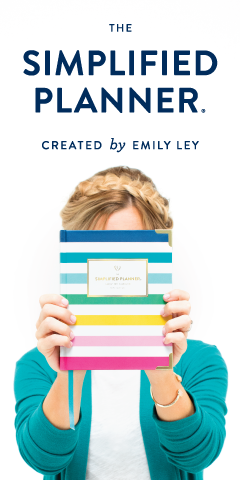 LOVE these tips and just the whole idea of getting it all done and organized makes me so happy! I so need to do this! Such great tips! This may be a silly question, but all the music you have, is that also on your phone? I sort my pictures the same way! I don't have any digital music though, something I really want to look into starting! I love this tutorial so much! Before I started working with my current company, I had literally zero ideas how to do any of this. I love how you organize all your digital media! bookmarked and sending to my Mama asap!! I really need or organize my digital photos...or just upload them from my phone! I have so many years' worth and I love having access to all of them whenever I want, but it takes up SO much space on my phone! I really need to organize our pictures! I did a really good job for 5 years but the past 10 years I have not done a great job. You are motivating me to get to work! I have also not heard for Amazon Drive! That will be life changing. I have an external hard drive but my worst fear is our house going up in flames and then we would loose that drive :( I will be looking into Amazon Drive. I love this, I pretty much do it the same way, but I keep my blog photos and regular photos in separate folders. Since I take so many of each. 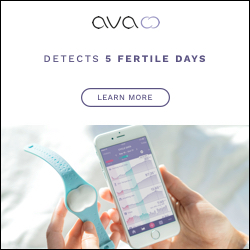 Thank you for your helpful tips! I'm so bad at organizing on the computer, so I appreciate you giving these tips to me. I need to take some time to get organized! I'm glad I could help! Good luck! Holy moly - I need to do this so so so very bad. It's been weighing me lately that this issue is only getting worse and I need to get stuff organized! This is so impressive, and I can only imagine how good it feels to have it done! This is great information and I admit, I need to heed it badly! Not only this, but I need to organize years worth of actual photos. Thank you for sharing your system with us on Party in Your PJ's! I pinned to my Organize board. Thanks so much for pinning! Good luck working on yours!